On any trip to Greece, it's helpful to have some knowledge of the Greek gods and goddesses. The Greek goddess Hecate, or Hekate, is Greece's dark goddess of the crossroads. Hecate rules over the night, magic, and places where three roads meet. 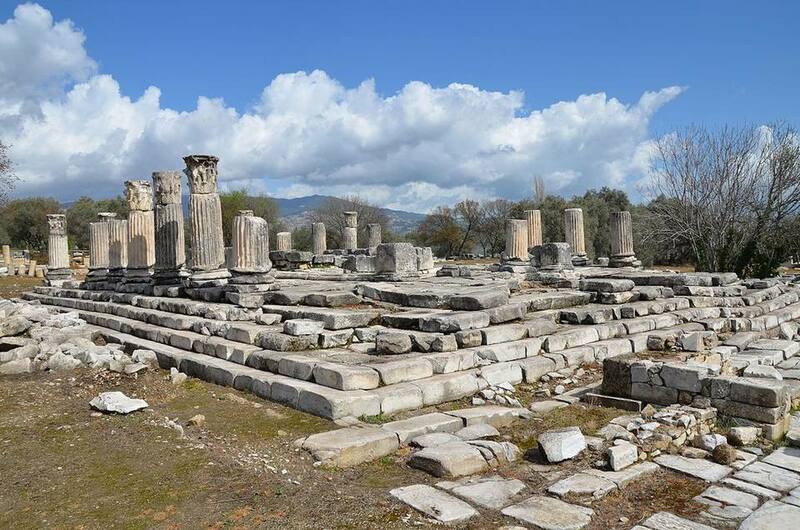 Major temple shrines to Hecate were in the regions of Phrygia and Caria. Hecate's appearance is dark-haired and beautiful, but with an eerie edge to that beauty befitting a goddess of the night (though the actual goddess of the night is Nyx). Symbols of Hecate are her place, the crossroads, two torches, and black dogs. She is sometimes shown holding a key. Hecate is defined by her powerful magic, being at ease with the night and darkness and in wild surroundings. She's ill at ease in cities and civilization. Persis and Asteria, two Titans from the generation of deities prior to the Olympians, are the legendary parents of Hecate. Asteria may be the original goddess associated with the Asterion mountain range on the island of Crete. Hecate is usually thought to have originated in Thrace, a wild northern region of Greece that is also known for its tales of Amazons. Hectate has neither spouse nor children. The Greek name of Hecate may derive from an earlier Egyptian frog-headed goddess called Heqet, who ruled over magic and fertility and was a favorite of women. The Greek form is hekatos, which means "who works from afar," a probable reference to her magic powers, but it may also distantly reference her possible origins in Egypt. In Greece, there is some evidence that Hecate was originally seen as a much more benevolent, cosmic goddess. Even Zeus, the King of the Olympian Gods, is said to have reverenced her, and there are hints that she was considered to be an all-powerful goddess. Hecate was sometimes seen as a Titan, like her parents, and in the battle between the Titans and the Greek gods led by Zeus, she helped Zeus and so was not banished to the underworld with the rest of them. This is especially ironic since, after this, she seems to have become more associated with the underworld, not less. Hecate Triformis, Hecate of the three faces or three forms, corresponding to the phases of the moon: dark, waxing, and waning. Hecate Triodos is the specific aspect presiding over crossroads. Hecate appears in many plays and poems as the personification of darkness, the moon, and magic. She appears in Ovid's Metamorphoses. Much later, Shakespeare referenced her in Macbeth, where she is mentioned in the scene of the three witches boiling together their dire brew.